Since 2004, Appalachian has presented a fun and interactive fair that provides easy and accessible ways to learn about cultural and religious international holidays. How do you improve policy- and decision-making? Appalachian State University students and faculty research current economic and policy issues, economic development, environment and energy, and public finance. They use three laboratories on campus to conduct their research. Meet Dr. Todd Cherry, the man who coordinates this research that is helping improve decision-making in North Carolina. Mudbound is Hillary Jordan's first novel but her work has already been compared to that of William Faulkner and Eudora Welty. Her story of racial prejudice in the 1940's Mississippi has been named one of the top ten debut novels of the decade by Paste Magazine and has won a Bellwether Prize. How do you build the most affordable efficient home that uses renewable energy systems? Appalachian State University students and faculty comprise one of twenty select teams from around the globe crafting such a home as part of the 2011 Solar Decathlon, the world's largest and most recognized green building competition. Appalachian State University is dedicated to enhancing the physical, emotional and social health of residents of North Carolina and beyond—to advance our work in this area. The university has established a new college of health sciences. Coming up on Appalachian Perspective we'll meet the founding dean and learn what the new college means for preparing high quality professionals in these fields. In his role as provost, Dr. Stan Aeschleman strengthened Appalachian State University's academic core and created the vision for which the University has become known—a unique institution that blends aspects of a research institution with those of a small liberal arts institution. After many years as an administrator, he has chosen to return to teaching later this year. We'll meet this visionary and beloved psychology professor on Appalachian Perspective. The 111th United States Congress is tackling some of the most historic issues ever in our democratic society, including the reform of health care, financial services and campaign ethics as well as how to protect our natural resources for future generations. My guest Congressman David Price and I will discuss these topics and more. Today's employers demand strong leadership skills, and getting involved in campus life isn't the only way to develop them. 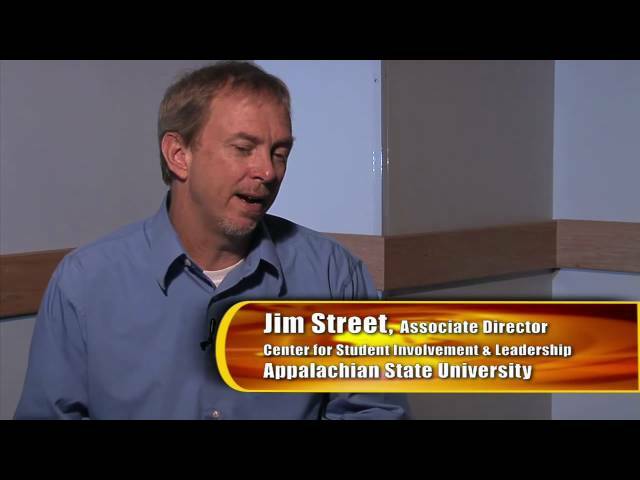 At Appalachian State University, students can actually pursue a minor in leadership studies as they participate in clubs and organizations.